If you'll be at the AWP conference next week, I'll be reading off-site, signing at the UW Press table, and speaking on a panel -- details below! If you’d like to interview me or review my book, please feel free to be in touch! I am also booking readings and events this summer and fall. I’m stunned and heartened that some new poems from my manuscript-in-progress just won a 2018 award from the Sustainable Arts Foundation. They’re an organization that supports artists and writers with children, and I’m really grateful to receive a grant from them. Much admiration for all parents making room for creative expression in their lives, and the spouses and support networks who love us and believe in what we do. A full list of the awardees is here, along with descriptions of their work. 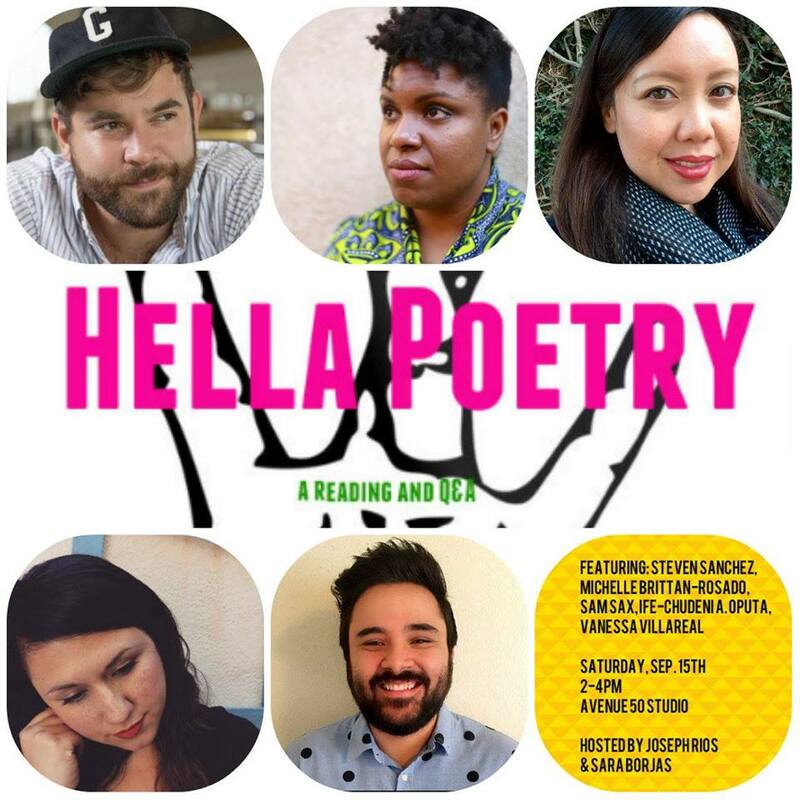 Next Saturday 9/15 I'll be a reader for HELLA Poetry in some excellent company with Ife-Chudeni A. Oputa, Steven Sanchez, sam sax, and Vanessa Villarreal, in conversation with organizers Sara Borjas and Joseph Rios. The venue is Avenue 50 Studio in Highland Park and we'll be reading at 2pm with Q&A to follow. I'll have copies of my chapbook, Theory on Falling into a Reef, for sale ($10) and postcards to hand out with the cover art and title poem from my forthcoming book, Why Can't It Be Tenderness (out in two months!). LA folks, hope to see you there! Panel: "Post-MFA vs. POC: Five Poets Speak about and Read from First Books"
In his essay “MFA vs. POC,” Junot Díaz sparked an important conversation about MFA programs, lack of representation in workshops, and meeting the needs of writers of color. In this panel, five poets extend this discourse to talk about writing after the MFA. They will discuss what resources helped them publish first books, including writing communities and conferences, PhD programs, and finding editors who value their work. Each panelist will also read from their recently published collection. I’m honored my poem “Fluency” will be included in Ink Knows No Borders, a timely anthology for young adults due out in March 2019 from Seven Stories Press. Many thanks to the editors, Patrice Vecchione and Alyssa Raymond, for creating this space for poetry about the experiences of immigrants, refugees, and their families. With authenticity, integrity, and insight, this collection of poems from some of today's most compelling voices addresses the many issues confronting first- and second- generation young adult immigrants and refugees, such as cultural and language differences, homesickness, social exclusion, human rights, racism, stereotyping, and questions of identity. Poems by Elizabeth Acevedo, Erika L. Sanchez, Bao Phi, Eduardo C. Corral, Chen Chen, Sholeh Wolpe, and a growing list of others encourage readers to honor their roots as well as explore new paths, and offers empathy and hope for those who are struggling to overcome discrimination. Many of the struggles immigrant and refugee teens face head-on are also experienced by young people everywhere as they contend with isolation, self-doubt, confusion, and emotional dislocation. Ink Knows No Borders is the first book of its kind and features approximately 60 poems and an introduction, a bibliography of recommended titles, a resource list of poetry organizations, and brief biographies of the poets. It's a hopeful and beautiful and meaningful book for any reader. It is available for preorder from Amazon here. I'm so looking forward to reading at the 1888 Center next week, with dear friend Steven Sanchez and new friend Mathieu Cailler! The event is free, and will also be recorded for the podcast, Writers' Block Live. It's from 7-9 p.m. at 115 North Orange Street, Orange, CA 92866. I'll have copies of my chapbook, Theory on Falling into a Reef, for sale ($10). You can visit the event page for the reading here. I'm thrilled and honored that my full-length poetry collection, Why Can't It Be Tenderness, has won the Felix Pollak Prize in Poetry and will be published by University of Wisconsin Press in Fall 2018. I am so grateful to the contest readers and the blind judge, Aimee Nezhukumatathil, for believing in my work. I'll keep this website updated with any news, including a projected publication date and readings to celebrate the launch later this year. Congratulations to the other authors who will also be published in the Wisconsin Poetry Series: D. M. Aderibigbe, Betsy Sholl, Rebecca Hazelton, and Melissa Crowe. The full announcement is here! It was an honor participating in the Writers Resist LA event on January 14, 2018 at Beyond Baroque in Venice, California. The event marked one year since the presidential inauguration, and more importantly, a year of art and resistance. The reading was, for me, a moving reminder of the power of words to illuminate the historical moment in which we're living, to sharpen and raise our voices, and to nourish one another in our shared struggle. If you were unable to attend, you can watch a video of the event on YouTube here. My reading begins at the 1:36 mark. I'm honored to be included in a reading for Writers Resist Los Angeles, taking place at Beyond Baroque next Sunday, January 14, from 1-4 p.m. The lineup is stellar, and the cause is urgent and necessary in this current political climate. Hope to see you there! Last January, just prior to the inauguration of our current president, a monumental Writers Resist reading was staged featuring some of Los Angeles’ most distinguished writers and poets. Presented as part of a national and international day of literary protest, the event attracted an overflow crowd of more than 300 at Beyond Baroque Literary Arts Center in Venice. The national situation has deteriorated since then. Our country, its policies, environment, and population have been pushed into partisan chaos, making the Writers Resist movement more important than ever. In response, David St. John, Jim Natal, Emily Vizzo—three of the original Writers Resist Los Angeles organizers, along with Lynne Thompson—will be hosting a second Writers Resist event on Sunday, January 14, 2018 from 1:00-4:00 PM. The venue again will be Beyond Baroque, which is beginning its 50th anniversary programming with this reading and presenting it admission free. And, once again, PEN Center USA, will be a contributing sponsor. The American Civil Liberties Union of Southern California also will have a presence at the event and will be accepting donations. Writers Resist is not affiliated with a political party. At Writers Resist events, direct political discourse is bypassed in favor of an inspired focus on the future, and how we, as writers, can be a unifying force for the protection of democracy. In order for us to heal and move forward, individually and as a nation, we believe people need something to be for in this anxious climate. The only thing we “resist” is that which attacks or seeks to undermine those most basic principles of freedom and justice for all. Please join us to help advance a climate of change! I'm thankful to Poetry Daily for featuring "Poem to My Unborn Son the Morning after the Election" as the feature for September 28, 2017. You can read it online here, and in the new print issue of Alaska Quarterly Review. Thrilled to have my poem, "Ode to the Double 'L'," published in this week's issue of The New Yorker (March 20, 2017). Read it online with audio here. Chapbook launch & reading details! Please join me for a public launch of my chapbook, Theory on Falling into a Reef, recently out from Anhinga Press and winner of the 2016 Rick Campbell Prize. I'll give a short reading, and copies will be available for purchase and signing. Light refreshments provided, too. Hope to see you there. Sunday, June 5 from 3:00-4:30 p.m.